Write an article about Tajine and suddenly you have make it. Francene cooked this citrus chicken version and it was a delight. 1. In a mortar (using a pestle), smash ginger, turmeric and garlic. Pound and grind until a paste is achieved. Or, using a small food processor, blend ginger, turmeric and garlic into a paste. 2. In the bottom of a flameproof tagine, heat oil and melt butter over medium heat. Add spice paste, cinnamon and cumin and cook, stirring frequently, for 3 to 5 minutes or until paste is lightly colored. Add chicken and toss to coat in the spices. Cook, turning frequently, for about 7 minutes or until chicken is browned on both sides. 3. Using tongs, turn chicken so that the skin is up. Tuck orange sections and dates around chicken. Stir in orange juice, lemon juice and molasses and bring to a boil. Cover with tagine lid, reduce heat to low and simmer for 30 to 40 minutes or until chicken juices run clear for thighs and is no longer pink inside for breasts. Garnish with almonds. A very easy recipe to follow and the kitchen aromas are just wonderful. We had a six pack of chicken legs in the freezer and used them. On hindsight, I would not use legs, maybe bone in thighs or breasts cut into thirds. This isn’t finger food unless you enjoy yellow cuticles for a week. The turmeric will color and stain very easily. We served the chicken tagine with a side of zucchini and a delightful tomato and cucumber salad. I wrote a short piece on comfort food. Then I kept re reading it and re writing it & then trashed it. It just rambled on about what I think comfort food is. I think I realized it was more important to cook it than analyze it. My short definition would be that comfort food be filling and simple, and to me it’s a one pot dish. The pot often defines what will be cooked and the Tajine is a reflection of a region and style of cooking. The Tajine is a Moroccan cooking vessel. 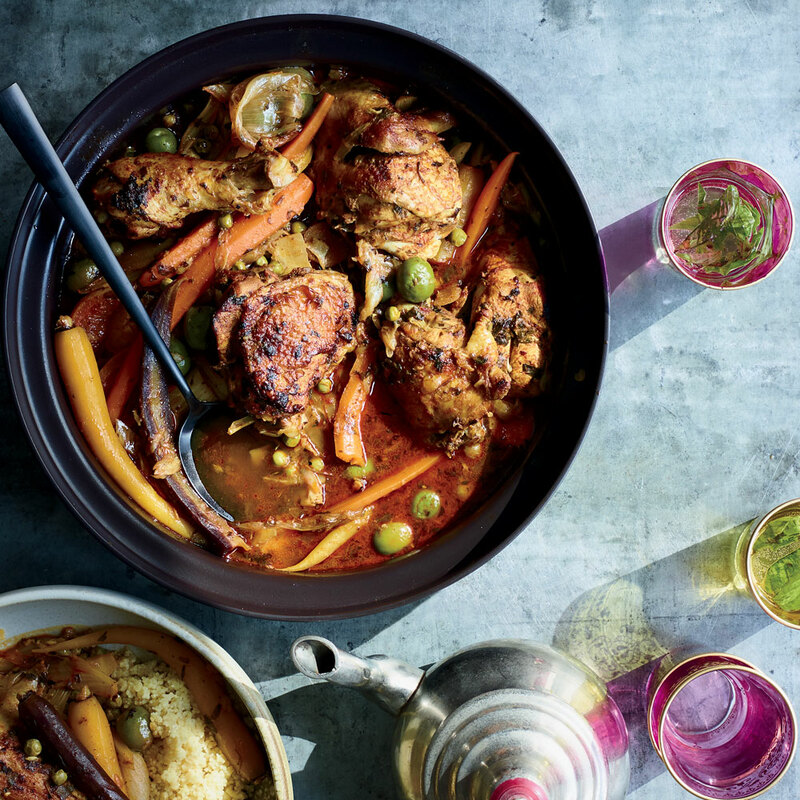 I can’t think of a Tajine without thinking of Moroccan dishes, curried chicken & lamb stews. Francene and I are fortunate to have several Asian style markets in the area so when we shop for something like curry, we have more styles to select from than most markets have Mexican hot sauces. With so much variety to stir the imagination, we just have to experiment; both with flavors as well as technique. 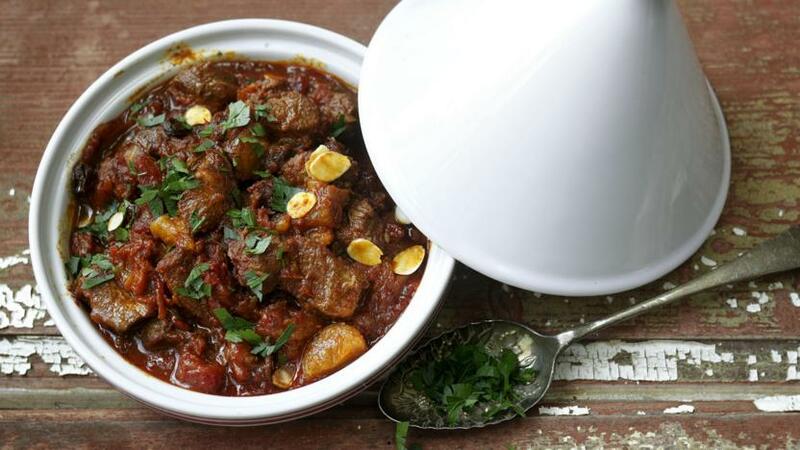 A wonderful lamb tajine from Antony Worrall Thompson, on the bbc.com website. In a world of instant cookers, rice cookers, pressure cookers and cast-iron enameled ware there is also that funny looking Tajine. In a world full of the above-mentioned cookers, why in the world would you want to use a Tajine? Because it is versatile, a Tajine in the right hands can replace all those newly hyped cookers. The basic Tajine is a clay pot and lid that has been enameled and fired. You should never use it over a high flame as it would crack and break. Since the Tajine style of cooking works so well, you can now get them in enameled cast iron from makers such as Staub and Le Creuset, and stainless steel from Cooks Standard. It’s the funny looking lid that is the secret to Tajine cooking. The high peaked sides are for the steam and condensation to rise to the top and the inverted cupped top drips the moisture back into the center of your dish. Think of this as a non stop basting process. We decided to go modern and get the stainless steel with ceramic lid and could not be happier. The stainless bottom is attractive enough to serve from and most of our cookware be it in cabinets, pantry or garage, we buy to cook with not set on display.